Our third aid station on Day 3 on the 2017 Pedal The Plains tour will be at the Eagles Nest Ranch, located along the South Platte River jest west of the tiny town of Masters. The ranch was established in the 1840s and named for the area’s habitat for nesting eagles. Today, the ranch covers more than 60 square miles. Livestock at the Eagles Nest Ranch are Angus and Wagyu, and alfalfa and corn crops are grown there. As you ride west on Highway-34 toward the ranch, look to the south side of the highway to see what remains of an important part of Colorado history: the farming town of Dearfield. Little remains at Dearfield, just a few nearly collapsed wooden buildings. It was proposed in 1909 by Oliver Toussaint L’Ouverture Jackson (O.T.) 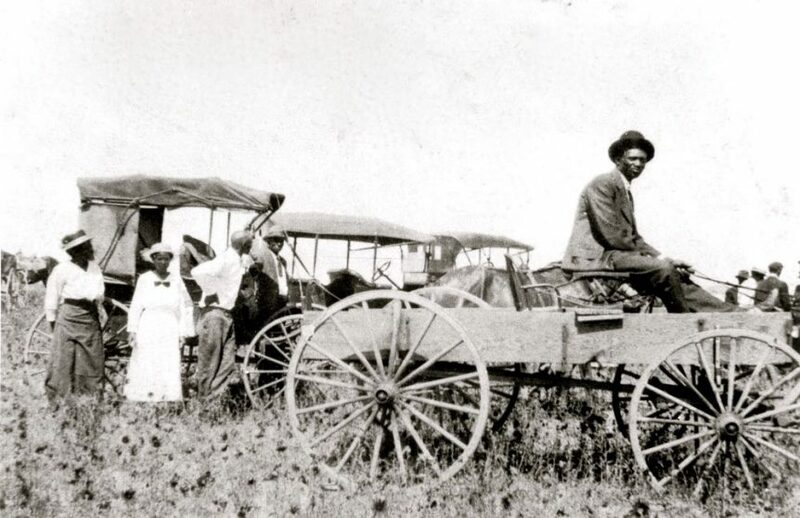 Jackson as a colony for ambitious African-American farmers. Early settlers of Dearfield had little or nor farming experience, and the land was too high above the Platte for irrigation. To survive, these novice farmers had to learn the methods of dryland farming, an important aspect of which is soil conservation. Crops grown around Dearfield included winter wheat, potatoes and sugar beets. For several years, the dryland farming technique yielded enough crops to sustain the community and to sell at the local railroad station. By the early 1920s, Dearfield had a population of 700 people (about 60 families), producing livestock, poultry and various crops. The town had its own school, restaurant, grocery store, boarding house, and two churches. However, the hard luck of water challenges, the dust bowl, the Great Depression and World War II, left Dearfield a ghost town by the late 1940’s, when only about 12 people remained living there. By the time we reach Aid Station 3 on Day 3, we’ll be nearing the finish line, and with ay luck, we’ll be enjoying a nice tailwind. But as we refill our last bottles of Skratch of the tour at the Eagles Nest Ranch, gaze southward across Highway-34, and remember the good people who once toiled and briefly prospered in the town of Dearfield. All contents Copyright © 2019 The Denver Post or other copyright holders. All rights reserved. This material may not be published, broadcast, rewritten or redistributed for any commercial purpose.